Fake Food Watch: Fake Food Products Endorsed by Doctors: Bogus Claims, Empty Promises? Fake Food Products Endorsed by Doctors: Bogus Claims, Empty Promises? Be wary of food products endorsed by doctors. Very wary! "When you see a product that's endorsed by a doctor, keep in mind that the doctor is probably being paid for that endorsement, just as if he were an athlete or an actor, so take it with a grain of salt," warned one local TV station. The medical establishment can be seduced by money to hawk all manner of questionable products, from dangerous prescription drugs to processed breakfast cereals, quasi-useless supplements, and genetically modified foods. 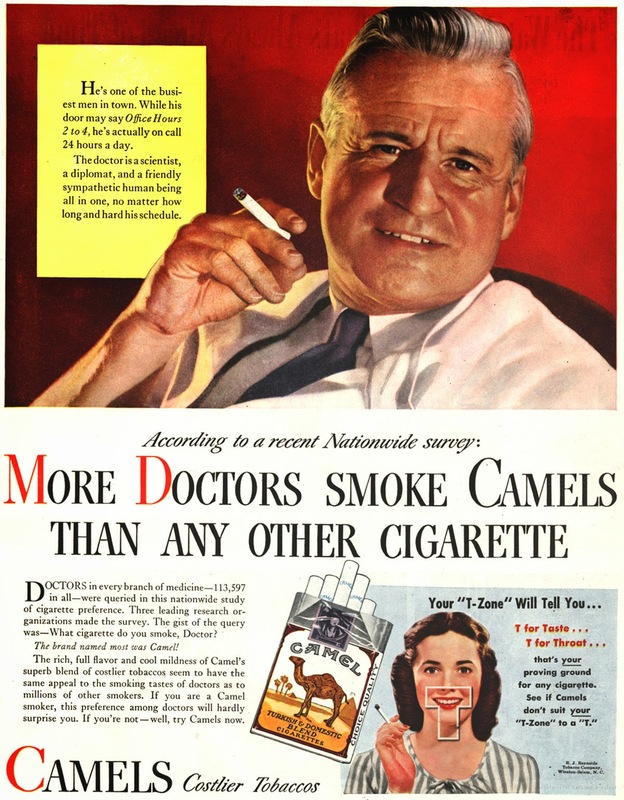 Yes, even cigarettes, years ago. Not all in the medical establishment can be enticed by all-expenses-paid junkets, pricey speaking engagements, meals and gifts, scads of free samples, and various forms of direct payments. But sadly, far too many succumb to financial temptation from vendors with something to sell. For example, take Ensure "nutrition drinks" and "meal supplements," which are manufactured by Abbott Nutrition, part of Big Pharma corporate giant Abbott Laboratories. Abbott Labs is the maker of addictive painkiller Vicodin and dozens of other highly profitable drugs. "#1 doctor recommended brand" blares on the label of every bottle of Ensure's various nutrition drinks. Yet, Ensure is formulated mainly of sugar and water, spiked with innumerable chemicals, and loaded with preservatives, additives, and artificial flavorings and colors. ".. the top two ingredients in Ensure are almost identical to the top two ingredients in soft drinks! ... the top four ingredients (are): water, sugar, corn syrup and maltodextrin. That's basically three sweeteners and water. So if you were trying to be funny, you could call this product 'sugar-sugar-sugar-water,' because that is primarily what it's made of, according to the ingredients label... So essentially, what you have here with Ensure, is a predominantly sugar-water product that has been fortified with a few vitamins and minerals. "The phrase, 'Complete, balanced, nutrition,' in my personal opinion, is an outright lie. This product has nothing resembling complete, balanced nutrition..."
In 2012, sales of Ensure and Glucerna, its diabetic alternative to Ensure, were almost $2 billion.... thanks mainly to credibility lent to the products by many in the medical establishment. "As someone who is big on nutrition and an obsessive label-reader, one thing is obvious: Wheaties Fuel is basically Wheaties with more fat and sugar. "Regular Wheaties is a pretty simple cereal with only five ingredients: Whole grain wheat, sugar, salt, corn syrup and trisodium phosphate. One serving (3/4 cup) has 100 calories, .5 grams of fat, 4 grams of sugar, 15 grams of other carbs, 3 grams of fiber and 3 grams of protein, along with some added vitamins. Wheaties Fuel, in contrast, loads up on the sugar, with some added fat.... Fourteen grams of sugar per serving is a lot for anyone who cares about their nutrition." "... only largely found in tropical areas in the South Pacific where its cleanest and unspoiled places like Solomon Islands. The people there have consumed Skyfruit internally for over 1000 years. It is known as the queen of plants and knowledge of its healthful properties has been handed down from generation to generation to the present day. Common in the South Pacific, Sky Fruit is also found in small quantity in other tropical areas of the world." XKLWorldWide.com promotes that its "Herb Food Concentrate is made from 100% natural Skyfruit that is being advanced bio-technologically processed and prepared. The quality of XKLCare?products has earned worldwide recognition.? Testimonials? Of course, with claims of relief from inflammation, hypertension, backache, skin peeling, asthma, even diabetes. "We desperately need XKLCare™ product. Instead of waiting for your health care ship to come in, with this product you're already aboard." "It is with joy and pride that I endorseXKLCare™ product, the world's most potent natural food supplement." ""If you think XKLCare™ product is expensive, try disease. Based on the preventive effect and strong antioxidant activity of XKLCare™ product, I would like to say that it is indeed the most incredible dietary supplement I have ever come across." Be wary of products endorsed by doctors! Don 't buy into the credibility lent to quasi-healthy fake-food products by doctors and other medical professionals seeking to fill their coffers. If tempted, do your homework. Check out both the medical professional and the product via a simple Google searches. And read the labels, friends. Be your own informed advocate. health and fitness organization behind both the Oral B and Crest oral health and Health and fitness proper care manufacturers. These are just two of the many Jenny Scott manufacturers that Proctor and Bet produce but all of them are impressive. Such a great insight Deborah. I do agree with you and we need to be more honest to provide the advise to the patients. Dentists are the most precious people and they always need to have the best techniques. I see the Dental treatment Abroad is great and great for the people who want some dental treatment.